Yesterday I whipped up this new alphabet game and decided that it would make a great freebie. You can download it from my TPT store. Click on the picture to get your copy! Please leave feedback and/or a comment below. I love to know if it is useful and how you use it in your classroom. 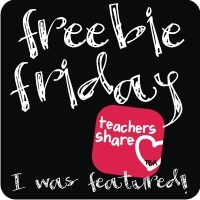 I am linking up with Manic Monday at Classroom Freebies and Freebie Friday s at TBA. If you love freebie like I do, it is definitely something to check out! Thanks for this printable I look forward to using with one of my groups!